Danish genre painter; born May 11, 1797, at Altona, Sleswick-Holstein; died in Rome Feb. 1, 1861. He studied at the Academy of Arts and in Lorentzen's Malerskole ("painters' school") in Copenhagen, and became, in 1814, a pupil of the Modelskolen, where he was twice awarded a silver medal (1816 and 1818). One of his first paintings was "Gretchen Kneeling Before the Holy Virgin," which was exhibited at the Academy of Arts in 1818 and which received much favorable comment. 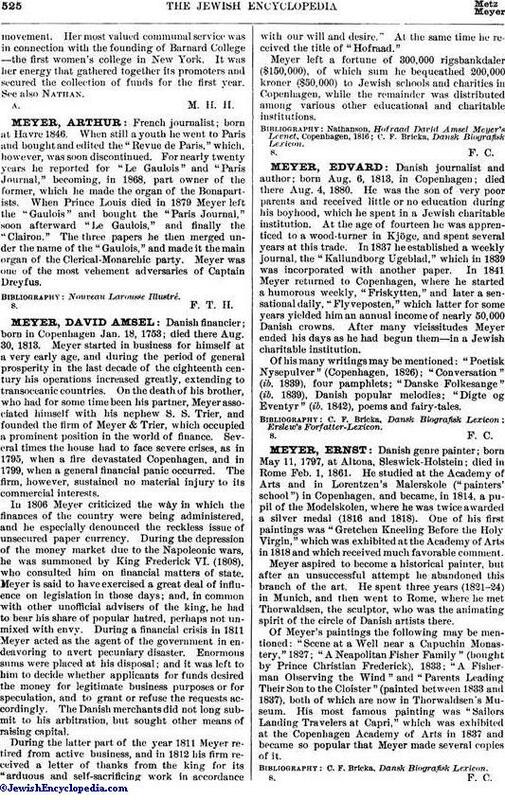 Meyer aspired to become a historical painter, but after an unsuccessful attempt he abandoned this branch of the art. He spent three years (1821-24) in Munich, and then went to Rome, where he met Thorwaldsen, the sculptor, who was the animating spirit of the circle of Danish artists there. Of Meyer's paintings the following may be mentioned: "Scene at a Well near a Capuchin Monastery," 1827; "A Neapolitan Fisher Family" (bought by Prince Christian Frederick), 1833; "A Fisherman Observing the Wind" and "Parents Leading Their Son to the Cloister" (painted between 1833 and 1837), both of which are now in Thorwaldsen's Museum. His most famous painting was "Sailors Landing Travelers at Capri," which was exhibited at the Copenhagen Academy of Arts in 1837 and became so popular that Meyer made several copies of it.